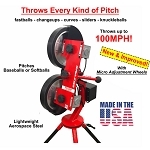 Combo Pitching Machines • Guaranteed Lowest Prices • Free Shipping! 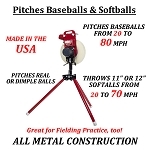 Do you have both a baseball and a softball player in the house? 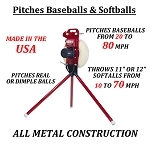 You don't have to buy two machines or decide between the two; our combo baseball & softball pitching machines offer the best of both worlds. 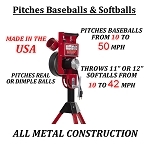 Check out our full range of combination baseball and softball pitching machines, below. 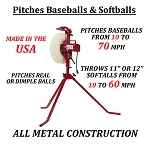 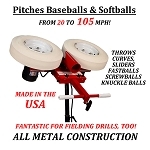 There is further information about the combo pitching machines under the product listings. 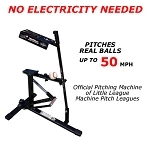 On a strict budget? 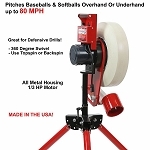 Choose from our ultra portable Louisville Slugger pitching machines, some of which can even throw soccer balls or volleyballs or the affordable Heater Sports combination baseball & softball pitching machine. 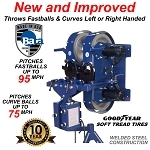 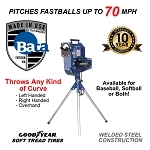 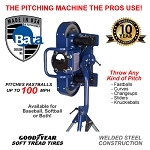 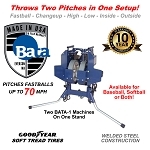 For those with a little more money to spend and who are looking for a combo pitching machine that lasts for many years, choose from extremely well built and powerful First Pitch combo baseball/softball pitching machines or one of several pro-grade BATA combo pitching machines. 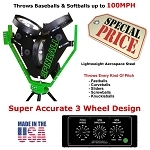 We now even have the biggest name in the pitching machine game - JUGS Sports - added to our lineup as well as another top name in baseball and softball products - Rawlings (made by Spinball Sports). 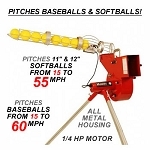 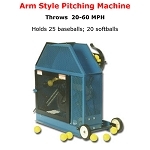 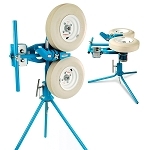 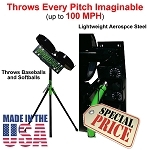 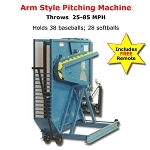 One of our combination baseball and softball pitching machines is sure to fit your budget and needs. 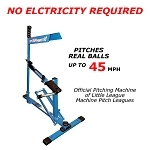 They all feature manufacturer warranties and ship free, too!